When the screed over an underfloor heating system dries, you can expect it to expand and contract with the changes in temperature. In order to protect the floor, and prevent it from cracking, expansion joints should be fitted during installation. An expansion joint can be easily made out of Nu-Heat’s edge insulation or any other flexible material, cutting holes around the tube position. The purpose of an expansion joint is to allow movement to happen within the screed floor, releasing any stress build up to avoid cracking. When should I use expansion joints? For both liquid anhydrite and sand and cement screeds, expansion joints should be placed in high stress areas – these are where large areas are in contact with smaller ones e.g. in L or T shaped rooms. 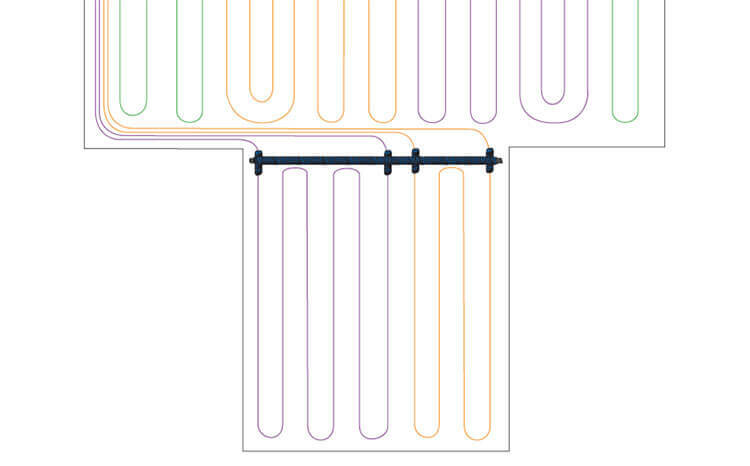 Expansion strips should also be used where UFH tube passes through doorways. In sand and cement screed floors, expansion joints should be fitted when the surface area of the screed is great than 40m² or within any single length of screed greater than 8m. Expansion sleeving also prevents any stresses from building up in the tube to avoid damage. It should be placed around any piece of UFH tube that runs through an expansion joint (300mm either side). Download our Screed Floors Information Sheet for more info.